This is the week of the World Tour Finals, the year-end event wherein the best eight players on the men’s tennis tour all beat each other up and figure out who is the best one. This year the crew includes both Roger Federer and the highly regarded Roger Federer cover band that performs under the name Grigor Dimitrov. The genuine article won his opening match yesterday, and with Rafa limping around the court at time of writing, he looks like the favorite to win this title. Earlier today, Federer Lite won his match against Dominic Thiem, 6-3, 5-7, 7-5, and on this second point he perfectly channeled the spirit of his dad. 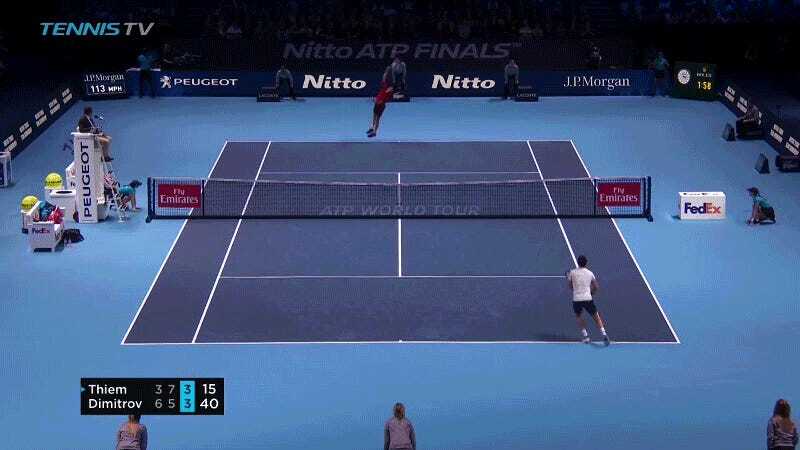 Sneaking into the net off that sliced serve return was an audacious move; the perfectly carved drop volley was Dimitrov’s just reward, and fortune favoring the bold. Also impressive, from the side view, is how he barely kept his body from toppling into the net, which would have lost him the point he’d just won so impressively. Here is the thousandth reminder that this dude has supreme volleys to go with great mobility and flexibility; I feel like he’s spent half the season hitting winners in a full split. Earlier this year, when Federer yapped at the younger generation to get up to net, he was talking to Grigor Dimitrov most directly of all. Everyone seems to know it, too. In August I asked young phenom Sascha Zverev (who is also present this week in London) about Federer’s remarks; he said they weren’t meant for him but for “somebody like Dimitrov, who has a great volley game—it was more towards someone like him than someone like me.” It’s nice to see Grigor taking note. Why Don&apos;t You Ding-Dongs Come To The Net?